Nickel telescope at Lick Observatory's main building. Photo by Laurie Hatch. This Call is for Requests for Observing Time on the Small Telescopes (40-inch Nickel and CAT) for Second Quarter 2019. The application process begins now and will end promptly at 5:00 PM PST local time on Friday, April 5th, 2019. The Nickel 1-meter (40-inch) telescope and Direct Imaging Camera (CCD-C2) are equipped for remote operation and are available for such use. Only observers with experience observing locally with the Nickel telescope and Direct Camera are eligible to observe remotely. For new observers, an additional checkout must be completed on site, using the local host zola to simulate remote operation, as well as a checkout on the first night of actual remote observing, to be conducted via video-conferencing. Applying for time with the Nickel telescope requires firstly a submission of a cover sheet followed by a scientific justification. 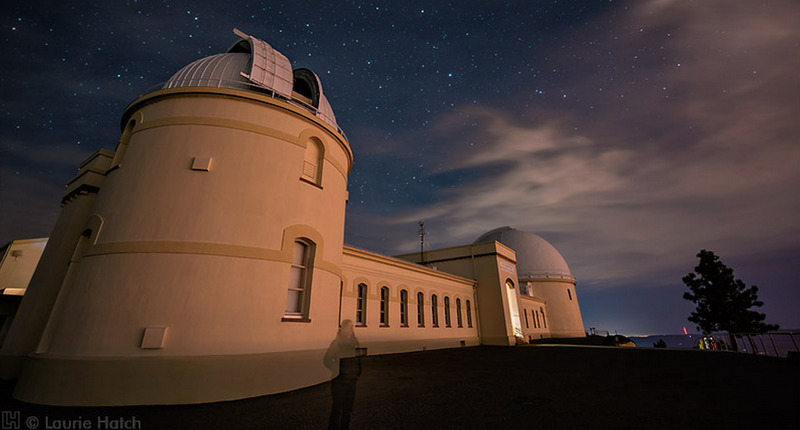 You can access the online cover sheets for the Nickel telescope at https://spg.ucolick.org/cgi-bin/time_apps/1m/ along with instructions on how to submit the accompanying science description. To access this page it will be necessary to enter the cover sheet ID number that is assigned at the preceding cover sheet submission stage. The Shane Proposal Guidelines at: http://www.ucolick.org/main/science/observers/shane-proposalguidelines.html can be followed in preparing a science description for a Nickel proposal. In summary, this ideally comprises a Scientific Justification (up to two pages in length), Technical Remarks that specify the program objects and anticipated exposure times, an acknowledgement of any supplementary observations from other observatories that are part of the program, a review of the status of proposals awarded time at Lick Observatory telescopes in the past two years, and a list of papers from the past five years that have used data from Lick Observatory telescopes (not the Keck telescopes). Graduate students are encouraged to apply for Nickel time; a letter from the thesis advisor should be attached indicating that the student is in good academic standing. Remote observing with the Nickel telescope must be done from one of the mainland approved sites. Proposals for remote observing must specify the facility from which the observer will be working and include a list of up to four filters and the order in which they are to be installed. In all other ways, the remote proposal process is the same as for local observing. If you plan to submit a remote observing proposal, please consult the following web pages before preparing your proposal. Important: The CAT will only be offered on a restricted basis. Users who wish to apply for CAT time in 2019 Quarter 2 should contact Graeme Smith before submitting a request. Please make a realistic estimate of the number of nights you will need for your program. Include enough information in your requests so that we fully understand the scientific aims of your proposed program and, specifically, what observations you plan to make.